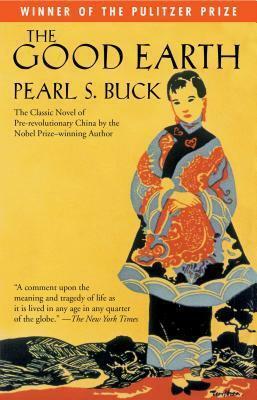 Nobel Laureate Pearl S. Buck's epic Pulitzer Prize-winning novel and Oprah Book Club selection about a vanished China and one family's shifting fortunes. Though more than seventy years have passed since this remarkable novel won the Pulitzer Prize, it has retained its popularity and become one of the great modern classics. In The Good Earth Pearl S. Buck paints an indelible portrait of China in the 1920s, when the last emperor reigned and the vast political and social upheavals of the twentieth century were but distant rumblings. This moving, classic story of the honest farmer Wang Lung and his selfless wife O-Lan is must reading for those who would fully appreciate the sweeping changes that have occurred in the lives of the Chinese people during the last century. Nobel Prize winner Pearl S. Buck traces the whole cycle of life: its terrors, its passions, its ambitions and rewards. Her brilliant novel--beloved by millions of readers--is a universal tale of an ordinary family caught in the tide of history. "Pittsburgh Post Gazette" One of the most important and revealing novels of our time. "The New York Times" A comment upon the meaning and tragedy of life as it is lived in any age in any quarter of the globe. "Boston Transcript" One need never have lived in China or know anything about the Chinese to understand it or respond to its appeal. Pearl S. Buck was born on June 26, 1892, in Hillsboro, West Virginia. Pearl began to publish stories and essays in the 1920s, in magazines such as The Nation, The Chinese Recorder, Asia, and The Atlantic Monthly. Her first novel, East Wind, West Wind, was published by the John Day Company in 1930. In 1931, John Day published Pearl's second novel, The Good Earth. This became the bestselling book of both 1931 and 1932, won the Pulitzer Prize and the Howells Medal in 1935, and would be adapted as a major MGM film in 1937. In 1938, less than a decade after her first book had appeared, Pearl won the Nobel Prize in literature, the first American woman to do so. By the time of her death in 1973, Pearl had published more than seventy books: novels, collections of stories, biography and autobiography, poetry, drama, children's literature, and translations from the Chinese. She is buried at Green Hills Farm in Bucks County, Pennsylvania.